Beautiful apartment. Lovely furnishings and very comfortable beds. Fresh milk for coffe/tea, cereal & pastries supplied. All bathroom requirements provided too. Everything was absolutely perfect. The apartment is beautiful,great location Milk in the fridge for breakfast, cereal and bread available what more could we ask for ! Exceptional hospitality! Will be back . Raymond was very welcoming and showed us round this beautifully presented Apartment. It was spotlessly clean and had everything you would need for a short or long stay. Attention to detail springs to mind with complimentary milk, rolls and cereal. The location was excellent with plenty restaurants and bars nearby. I would definitely return and recommend to friends and family. The location is very convenient, the staff is friendly and very helpful. The facilities are clean and tidy. Lovely apartment and fantastic location. Raymond was very helpful and informative. Lots of eateries on the doorstep. Good instructions how to travel to the apartment. Nice welcome by the host. Very nice welcome pack for breakfast the next day. Beautiful old building full of character in a sensational location. Raymond was very helpful & communication was very easy. Would definitely stay again. This is a complete home, fully-equipped and decorated to a very high standard - all you need is a toothbrush to feel completely at home. The location is superb for exploring Glasgow and enjoying the city life. As an elegant touch, we were met by the host both at check-in and check-out, and were made to feel very welcome. Communication with the host was one of the best we've had. This is extremely good value for money. 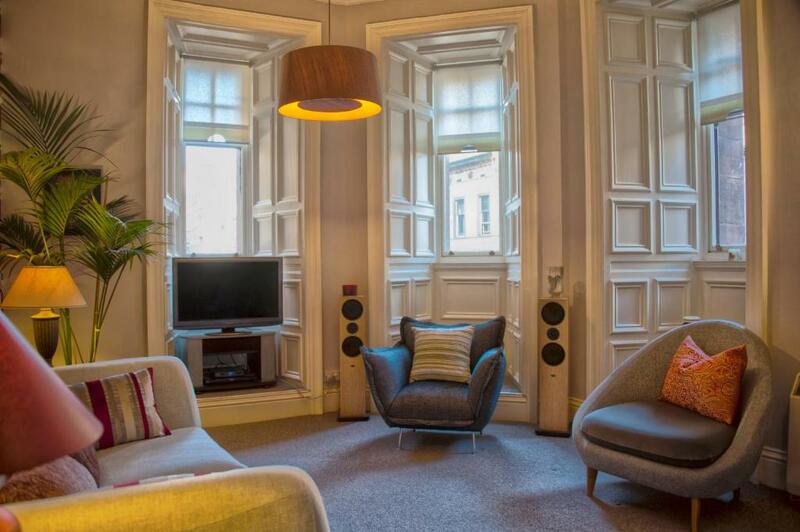 Lock in a great price for West George Street Apartment - rated 9.9 by recent guests. One of our top picks in Glasgow – and a guest favourite. At the heart of Glasgow, in an iconic red sandstone building, the award-winning West George Street Apartment is just a short walk from Buchanan Street Subway. It offers a spacious and modern 2-bedroom apartment with free Wi-Fi and balconies with city views. On arrival, guests get a free welcome hamper which includes cereal, tea, coffee, milk, sugar and more. Bars and restaurants can be found a few steps from the apartment. The lounge has a large sofa and 2 easy chairs as well as a dining table with 4 chairs. There is also free WiFi, a wide-screen digital TV, DVD and Hi-Fi system. The modern bathroom has a walk-in shower. Bedroom 1 has twin beds whilst Bedroom 2 has a king-size bed. Both rooms have floor-to-ceiling French doors and external balconies. The kitchen is fully equipped. Both Queen Street and Glasgow Central Stations are within a 5-minute walk, while the Glasgow Airport shuttle bus stops 200 yards from the building (outside Queen Street station). Glasgow City Centre is a great choice for travellers interested in shopping for clothes, shopping and nightlife. This is our guests' favourite part of Glasgow, according to independent reviews. This property also has one of the best-rated locations in Glasgow! Guests are happier about it compared to other properties in the area. Couples particularly like the location — they rated it 9.8 for a two-person trip. This property is also rated for the best value in Glasgow! Guests are getting more for their money when compared to other properties in this city. West George Street Apartment has been welcoming Booking.com guests since 1 May 2013. Good for couples - they rate the facilities 9.7 for two-person stays. When would you like to stay at West George Street Apartment? The building is accessed via a security controlled front door and the apartment is located on the second floor, with elevator or stair access. The lounge has a large sofa and 2 easy chairs as well as a dining table with 4 chairs. There is also free WiFi, a wide-screen digital TV, DVD and Hi-Fi system. The modern bathroom has a walk-in shower. Bedroom 1 has twin beds, Bedroom 2 a king-size bed. Both rooms have floor-to-ceiling feature French doors and external balconies. The bright, contemporary kitchen is fully integrated, with top of the range appliances. This is city centre living ... there are bars / restaurants / cafes all around, Buchanan Street (Glasgow's main shopping thoroughfare) is 100m away and both Glasgow Central & Queen St rail stations are a 5 minute walk away. Property surroundings – This neighbourhood is a great choice for travellers interested in shopping for clothes, shopping and nightlife – Check location Excellent location - show map Guests loved walking around the neighbourhood! House rules West George Street Apartment takes special requests - add in the next step! West George Street Apartment accepts these cards and reserves the right to temporarily hold an amount prior to arrival. Later check-ins are available upon request. Please inform West George Street Apartment in advance of your expected arrival time. You can use the Special Requests box when booking, or contact the property directly with the contact details provided in your confirmation. Nothing. It was all first class. All was excellent but of particular note were location, a very helpful proprietor and the great city that is Glasgow. Look no further....Superb apartment in a perfect location!!! We stayed in the West George st apartment for 3 nights. There were 4 of us and it could not have been better. Raymond was an exceptional host and made our arrival to Glasgow warm and welcoming. He supplied us with some very helpful information for our stay in Glasgow and made himself very accessible if we had any problems or questions throughout our 3 night stay. The apartment was five star accomodation. Period charm, tastefully furnished, comfortable bedding, and exceptionally clean. It was super comfortable with everything we could possibly need. The washing machine came in very handy travelling with a family of 4 . This was a real home away from home. The location of the apartment was superb and within easy walking distance to many cafes and shops. 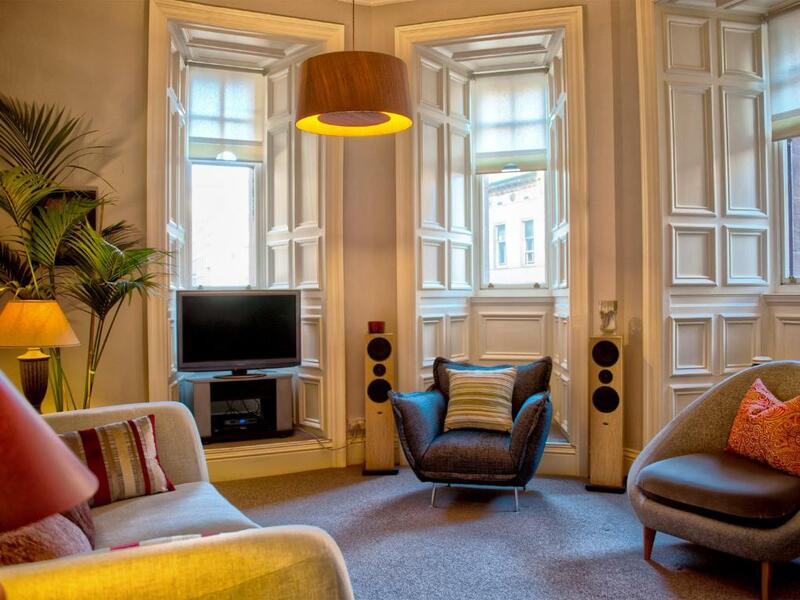 Staying in this wonderful apartment most definitely made our time in Glasgow relaxing and enjoyable. 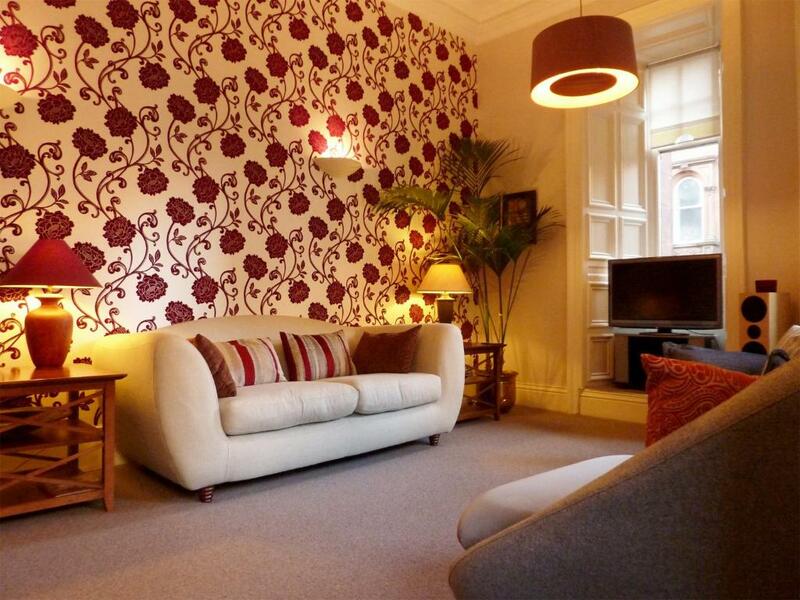 I would not hesitate to stay in this apartment again, and I would HIGHLY recommend it to anyone visiting Glasgow, because you will NOT be disappointed. The Apartment is in the perfect location. You only need to walk a few blocks to get “anywhere”. Taxis are close by for farther experiences. Raymond is the perfect host. I truly hated to leave this perfect Scottish apartment. Can’t wait to get back to this apartment in particular. The downside to the excellent location was obviously the noise from the street, which was extremely loud. We stayed midweek so it was just traffic but there is a nightclub directly across the road. With windows open for some fresh air the traffic was deafening. We stayed in October but this would put me off in the summer when you need windows open. 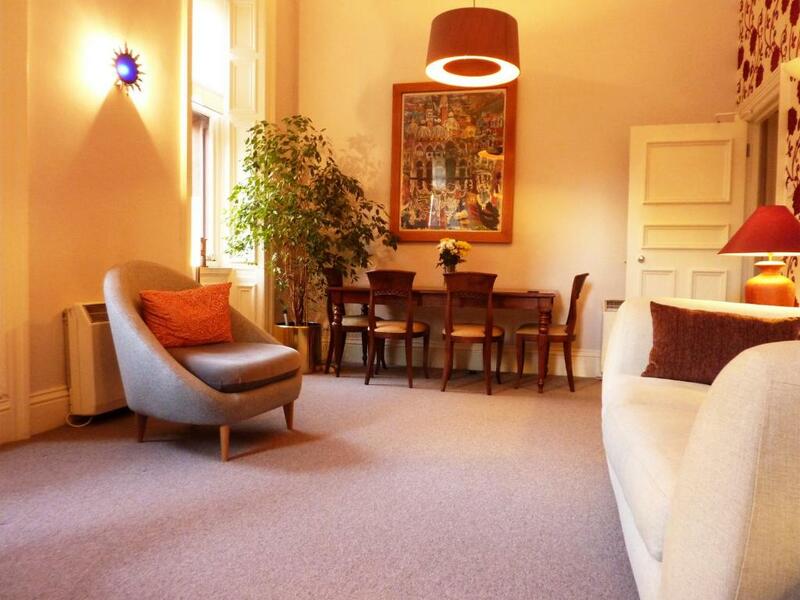 Beautiful flat in a great central location. Raymond was extremely attentive and a great host, giving us plenty of ideas for places to go, and was very accommodating in allowing us to check out a little late to suit our train time. The flat has absolutely everything you could need or want and has been decorated in impeccable taste. As I travelled with young children I spent the evenings in the flat and it was a lovely place to stay, a world away from your average self catering city centre holiday let. If I ever come back to Glasgow I wouldn’t hesitate to stay here again. We couldn't fault the apartment . It was lovely, with all the amenities you would require. . Comfortable bed & good shower. Great location for main streets and shops. Just a pity about the noise. The landlord was very helpful . Nothing was too much trouble. Milk and rolls provided on arrival plus cereals etc. Could do with a well lit area where there are sockets and a mirror for us ladies to do our makeup.